There wasn’t a cloud in the sky during Ho-Chunk Gaming Wittenberg’s traditional Vietnam Veteran’s Day ceremony on Thursday, March 29, 2018. Attendees united from near and far to commemorate the service men and women for their sacrifices across our great nation. March 29, 1973 marks forty-five years since the last combat troops departed Vietnam after a costly armed conflict. 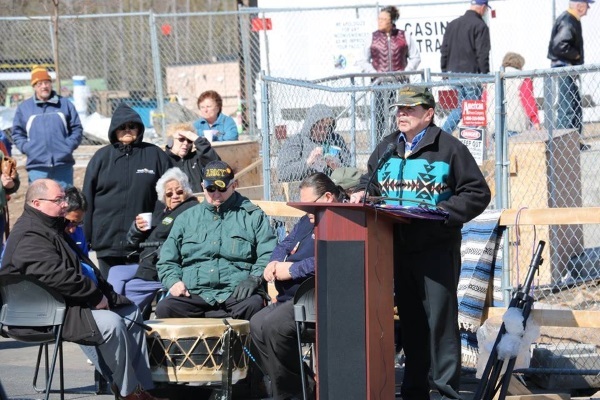 Each year, Ho-Chunk Gaming Wittenberg is dedicated to observing the national holiday with a Flag Raising ceremony which contributes to a national effort to acknowledge the Vietnam Veterans who were denied a suitable homecoming. “The Ho-Chunk People hold our Veterans in the highest regard. We respect their courageous and valiant efforts. Thank you to all the Brave Men and Women for your sacrifice!” Mr. Fletcher Collins, Executive Manager said. Mr. Collins provided the welcoming and opening statement during the ceremony. He respectfully acknowledged his Mother and Father’s military status and the Ho-Chunk Nation’s vigorous effort to support the Veteran community. Mr. Collins then turned the microphone over to the Master of Ceremonies and Executive Casino Host Manager, Mr. Beau Perry. Mr. Perry welcomed and introduced the Lake Delton Singers as they prepared to sing the Hoocak Flag Song while the flags were being raised. Next, Mr. Perry introduced and extended a special thank you to the Ho-Chunk Veterans who assisted with the flag raising: Anthony Gauthier – US Army (1964-1966), Sid Whitewing – US Army (1967-1969) and Peter Oknewski – US Army (1970-1979). Ho-Chunk Nation employees who assisted as well were: Michael Montgomery – US Army (1991-1998), Scott Mabry – US Army (2007-2011) and Walter Ross – US Marine Corp. The American Legion Post Birnamwood Darling Gunderson Post 341 Color Guard was then called upon for a 21-gun salute and the short, well-recognized melody better known as “Taps”. Keynote Speaker, Mr. Alton “Sonny” Smart, US Army Airborne Medic from 1970 – 1973; was introduced. Mr. Smart shared his personal experiences, his outlook and he extended many thanks to the Ho-Chunk Nation for allowing him to speak on behalf of the Veterans. “I was named after my Uncle Earl “Sonny” Madosh who was killed on Iwo Jima when he was eighteen. The old people told my Grandma that she needed to attend a ceremony because a Grandson would be born shortly and he would go west like her son and go over the ocean like her son and go to war like her son, so she needed to attend to make sure he comes back. I was that Grandson born and everyone then referred to be Sonny Madosh prophecy, hence my name. I went to Vietnam at age eighteen.” Said Mr. Smart. Mr. Smart also expressed his gratitude towards the Lake Delton Singers. The Lake Delton Singers brought the traditional Ho-Chunk culture to the ceremony by singing and drumming for the Hoocak Flag Song and the Elliott Decorah Veteran’s Song. Once the ceremony concluded, Ho-Chunk Gaming Wittenberg extended its gratitude to all Veterans by providing $15 Rewards Play, $10 off any Ho-Chunk Gaming Wittenberg food venue and the chance to win $100 Cash. Veterans who presented proof of military service at the Rewards Club Booth were eligible. In addition, guests enjoyed red, white and blue cupcakes and they received an entry for a chance to win a One Night Stay at the Ho-Chunk Hotel and $100 Rewards Play. There were 5 drawings beginning at 12 pm and they continued on every half hour. Ho-Chunk Gaming Wittenberg is owned and operated by the Ho-Chunk Nation.